Location and Significance. The Danajon Bank Project target area covers the entire Danajon Bank or Double Barrier Reef, located off northern Bohol Island, the only double barrier reef in the Philippines and one of only three such reefs in the Indo-Pacific Region (Pichon 1977). The reef is spread across almost 130 kms and consists of three large reefs. 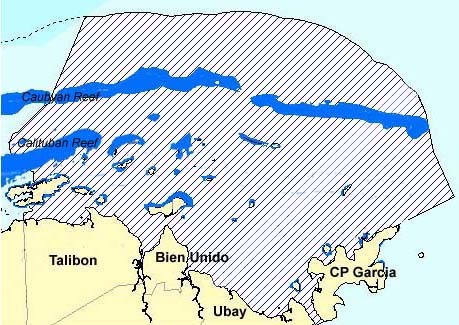 Caubyan is the largest covering about 143 sq kms; there are five smaller reefs in the northern outer region and one other large reef, Calituban, in the inner region (see map). The Bank has a total area of 2,142 sq kms and an aggregate coastline of 381 kms on 40 islands. FISH Project target area in Danajon Bank. Cross-hatched portion of map represents the Project's focal area. Click on image to view bigger map. Seventeen municipalities in four provinces and two regions have jurisdiction over the Danajon Bank. 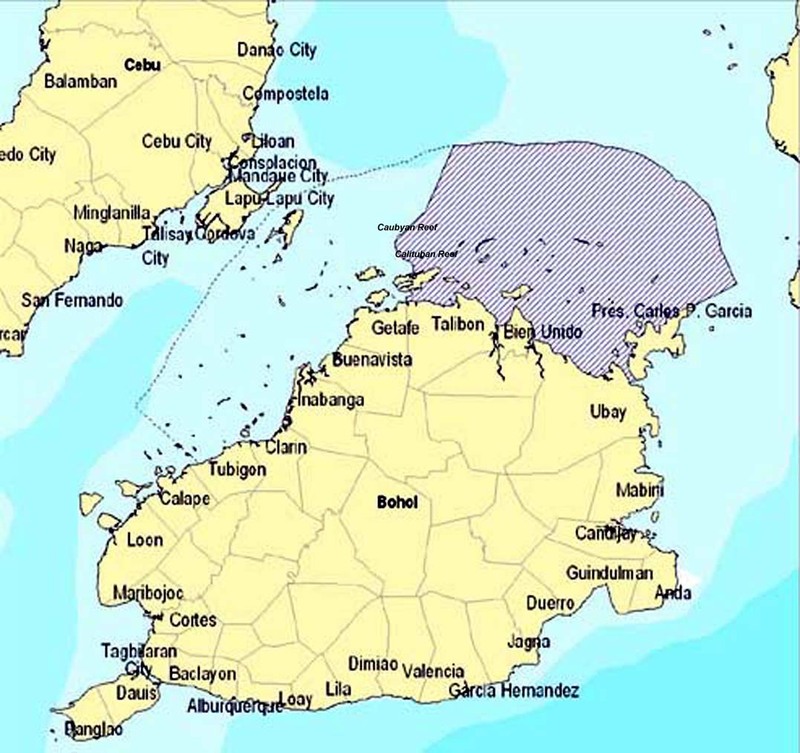 In Region 7, ten municipalities belong to Bohol and two to Cebu. In Region 8, one belongs to Leyte and four to Southern Leyte. Combined, these municipalities have a shoreline stretching to 699 kms. Of the 17 municipalities, four are in the Project's focal area, namely, Talibon, Bien Unido, Ubay and Pres. Carlos P. Garcia. FISH Project focal area (cross-hatched) in Danajon Bank. Coral reef areas are shown in blue. Danajon Bank has a highly diverse marine flora and fauna. Its location inside an 'inland' sea, the Camotes Sea, contributes to the high diversity of coral species (103 scleractinian and 3 nonscleractenian species, Calumpong et al 1997). The various islands have mangrove forests and there are wide areas of seagrass beds within and surrounding the Bank. Almost all species of seagrass that occur in the Philippines are represented. The Bank is also important in general as a source for biodiversity and known as a large breeding area for the Visayan and Camotes Seas through export of fish and invertebrate larvae and of biomass. Status of Coastal Resources. The Danajon Bank area has been subjected to extremely high fishing pressure. The use of cyanide and compressors in fishing is widespread. A 1995 survey of northern Bohol revealed many fishers preferred dynamite fishing over other methods because it yielded the highest average catch of 17.5kg per person-hour (ADB et al 2003). Fish catch has since dwindled even with the use of dynamite, because few fish remain in the area. A trawl survey conducted by the FISH Project on May 19-22, 2004 in its focal area showed an average trawlable biomass density of 0.45 tons per sq km. This indicates a very low demersal standing biomass for Danajon Bank, much lower than highly overfished traditional fishing grounds like Manila Bay in 1992-93, Lingayen Gulf in 1987-88, and San Miguel Bay in 1995-96. Overall, compared to the other FISH Project areas, mean catch rates of other fishing gears were relatively lower, with relatively low-value species caught (FISH Project 2005). Because the location of Danajon protects it from strong monsoon winds and heavy oceanic swells, sediments tend to accumulate inside the reef lagoons. This as well as the human factors mentioned above has contributed to the overall degraded condition of the reef. About 27 small marine protected areas have been legally established in northwestern Bohol, but most are not being effectively managed. Live coral cover inside and adjacent to three marine protected areas surveyed by the Silliman University Marine Laboratory for the FISH Project in 2004 showed reef condition in Danajon to be generally poor (Calumpong 2004). Past and Current Initiatives. A technical working group has been formed to study the best structure to operationalize a Danajon Bank Protection and Conservation Inter-Province Growth Quadrangle. In November 2002, the provinces involved (except Cebu), municipalities/cities(except Lapu-Lapu City) and representatives of concerned government agencies signed a memorandum of agreement creating the Cebu-Leyte-Bohol-Southern Leyte (CeLeBoSoLe) Council and technical working group to manage and conserve the Danajon Bank. Various other initiatives were undertaken in the past, involving non-governmental organizations and aid agencies, including Haribon Foundation through Project Seahorse, Local Government Development Foundation, Feed the Children, USAID through the Coastal Resource Management Project and the Bohol Environment Management Office, Japan International Cooperation Agency, and the Southeast Asian Fisheries Development Center. The Danajon Bank has also been selected as one of five project areas for the biodiversity conservation component of the Integrated Coastal Resource Management Project (ICRMP) supported by the Asian Development Bank and the Global Environment Facility. Asian Development Bank (ADB), Global Environment Facility, Department of Environment and Natural Resources, Tetra Tech EM Inc. and the Pacific Rim Innovation and Management Exponents Inc. (PRIMEX). 2003. Integrated Coastal Resource Management Project, Philippines, Final Report, Volume 3: Appendix 2: Global Environment Facility Eligibility Requirements. Tetra Tech EM Inc. and PRIMEX, 100p. Calumpong, H.P., J.S. Estacion and C. Acedo, Editors. 1997. Status of the Coastal Resources of the Bohol Learning Site (Jetafe to Calape). Dumaguete City, Philippines: Marine Laboratory and the Center of Excellence in Coastal Resources Management, Silliman University, 150p. Calumpong, H.P., Editor. 2004. FISH Project -- Baseline Assessment in Danajon Bank. Silliman University Marine Laboratory, Dumaguete City 6200, Philippines. FISH (Fisheries Improved for Sustainable Harvest) Project. 2005. Consolidated Report: Baseline Assessment of the Capture Fisheries and Marine Protected Areas (Reef Habitats) in the FISH Project's Focal Areas: Coron Bay, Danajon Bank, Lanuza Bay and Tawi-Tawi Bay. FISH Project of the Department of Agriculture, Cebu City, Philippines. 92 p.
Pichon, M. 1977. Physiography, Morphology and Ecology of the Double Barrier Reef of North Bohol (Philippines). p 261-267. In Proceedings of the Third International Coral Reef Symposium, Miami.